Fruit dryers (or driers), also known as evaporators, were built to dry pears, plums, and other fruit for market. Prune dryers were a very specific example of this type. In order to convert the plums into prunes, large dryers were built, particularly on Orcas. Originally adapted in Oregon from hop dryers, these large, two-story structures featured steeply-pitched pyramidal roofs with vents on the top that allowed heated air to rise through slats piled with fruit. According to newspaper records, there were dryers located at Crow Valley (?? ), Doe Bay (George Culver’s Alderbrook Farm), East Sound (the Langell and Pike farms), and West Sound (C.B. Buxton, W.O. Clark, and M.J. Reddig). On San Juan, a prune dryer was built near the Argyle Mill, and George Griswold had one on his farm on Shaw. San Juan County orchardists grew several varieties of plums, including Italian, Silver, and Hungarian, although the Italian was particular favored for prune production. Prunes were harvested in early September and taken to the dryers for washing and drying. According to the description of a prune dryer located in Clark County (a center of production from the 1880s -1930s), “the fresh fruit was first weighed, then immersed briefly in a boiling water and lye solution, dipped in clear rinse water, and then transferred to a shaker…where it is evenly distributed on trays” (Courtois 1979). Dryers were located near streams, springs, or wells for the water supply. A historic photograph of the Clark Dryer indicates workers with buckets of plums, holding screens, and rinsing the fruit. 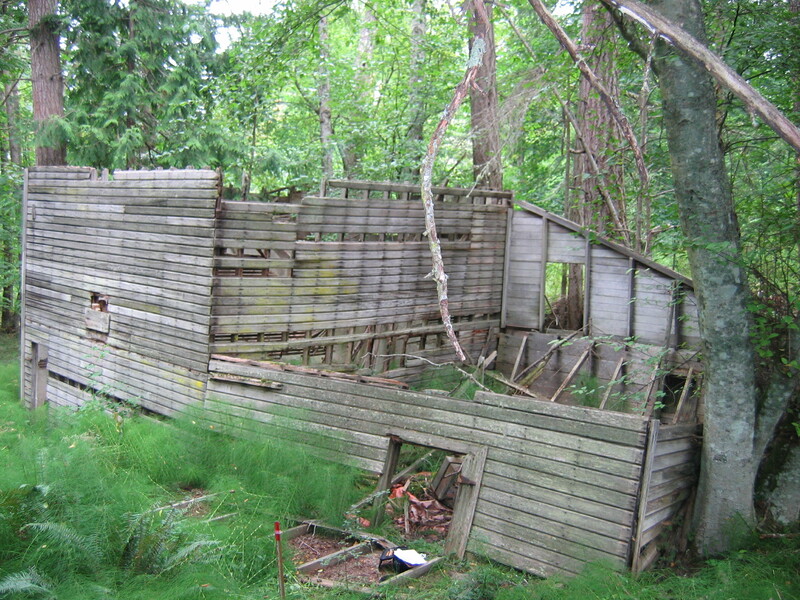 The only known example of this type is the Clark Prune Dryer, located near West Sound, Orcas. Sited on a slope next to an intermittent stream, the main structure is 19’6” square with a floor at about 11’ in height. Reconstructing from historic photograph, the wall rose another two feet above that, with a pyramidal roof above. There was a doorway entrances on the south (downhill) façade to the lower floor, and a dormer with doorway entry via ramp to the upper story on the north (uphill) side. Attached to the east side, along the slope, was a 19’-6” long shed, extending from 4’3” on the east to 13’0” where it attached to the east wall of the dryer. This shed appears to have a low crawl space at the height of the east wall, with a floored room above that. There were two entries to the structure: a 44” wide by 40” high doorway on the south side and a 22” wide by 24” high opening on the north. Although there were remnants of a fruit slicer and an electric heater in the shed area, as well as a 12” diameter opening for a stove pipe on the south side of the drier, it is not clear how the dryer was heated.